A small but encouraging milestone. It happened on the eve of my birthday a couple of weeks ago. I was waiting for it, but it was a pleasant birthday gift just the same. And my aversion to meta-blogging aside, I finally have time to tell you about it today. So I am hoping my long-term readers will forgive my obvious self-absorption and extreme narcissism as I get this post out of my system. My period of months of working two jobs is now about to settle into mostly one job and more time for my poems and projects, so this seems like a good springboard into the next phase of my blogging activity. 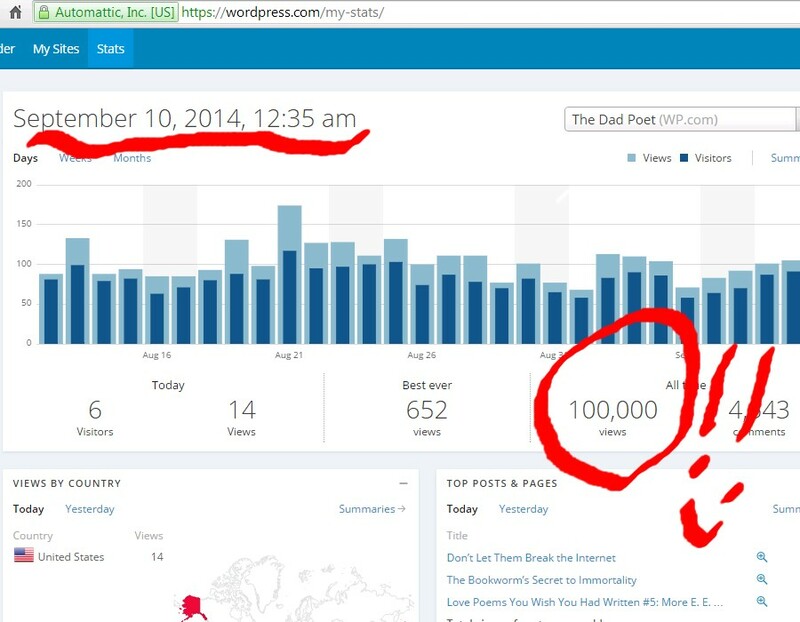 Luckily I managed, quite by luck, to catch the moment on the stats page when The Dad Poet hit the benchmark of 100,000 hits. Honestly, it took quite a while to get there, and I feel sheepish when I think about how I started this blog as a combination of exercise and therapy in September of 2008. But then again, those first four years were little more than three to four thousand hits each. It wasn’t until I started blogging in earnest and sharing my videos for National Poetry Month in 2012 that the whole thing suddenly burst into blossom, bringing over six times more traffic than before. And it’s never returned to those early low numbers. .Not bad, I thought, for a part-time poetry blogger who throws in a bit of nature and a great deal about his family. We focus too much on stats because they can be so utterly fascinating. Unfortunately they can also be puzzling. My best day ever was last September when search engines returned tons of hits for my review of Richard Blanco’s inaugural poem “One Today.” Odd thing was, the inauguration was not in September, and I’ve never been able to figure out why the spike happened that day. A rise in views always happens in April when I’m posting readings of favorite poems every day, either on SoundCloud or YouTube. But this also happens around Valentine’s Day whether I post or not because folks are looking for love poems. 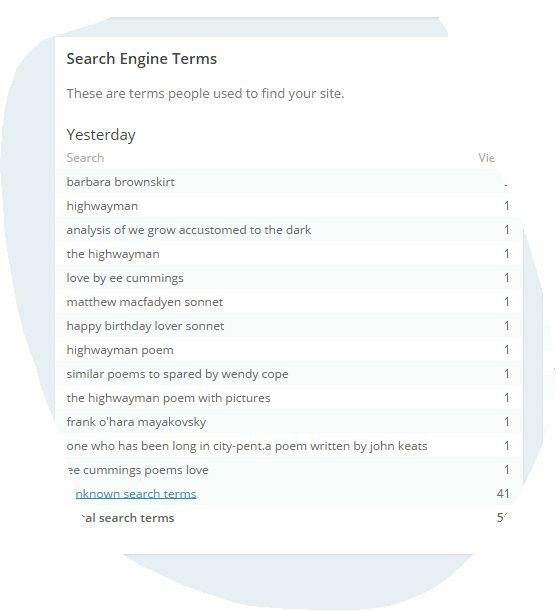 It seems that love poetry is always a popular search, no matter the time of year. This graphic shows the popularity of posts just yesterday, and right behind the main pages are posts from my series Love Poems You Wish You Had Written. This sort of thing is ALWAYS the case here on the blog. No, seriously, every day. Usually, as yesterday, E. E. Cummings leads the pack with Walt Whitman gaining right behind. Sometimes old Walt passes his young protegé and often Wendy Cope, shown in third place here, cuts loose and breaks ahead of everyone. There is also a graph where I can see who is searching for what, and what Bing-ing and Goog-ling leads readers to my blog. Although lately with many of Google’s search terms encrypted there is less information than there used to be. Still along with the others I’ve mentioned, searches for Maya Angelou, Alfred Noyes’ “The Highwayman,” and the illustrations by Charles Keeping get tons of searches. A blogging hint: If you use illustrations, always include the hidden description of the image you upload. This helps you show up in image searches. And while the list below is nicely representative, there are times when very strange search terms lead people to your site. That may be worth a meta-blog post of its own some day. The Laughing Housewife sometimes posts ones that bring quite a chuckle. I’ve been thinking for sometime that the Dad Poet blog was in need of a face-lift and a more grown-up look. So in honor of the 1000,000 hit milestone I bring you this new theme. Many of the header images from now on will be nature shots from here in Pennsylvania, including the one above which is a view of my home town here where the rivers meet. It was taken by my good friend John Helwig and I am grateful for his permission to use it. I’ll incorporated more on sort of a random rotating basis in the future, but this one feels like home. I also did quite a bit of tweaking and agonizing over the details in the header, footer and sidebar. They are of course not the most important aspects of this blog, but I want them to be relevant and useful. Cosmetically I am very pleased with the way it all looks now, though there is still some serious updating to do in the bio pages, particularly on the Poet page regarding recent publications and upcoming events. And don’t worry, I know many of you have expressed your fondness for photos of my sons and me. This will continue of course, but they are getting much bigger these days, and I’d like to grace the pages of the blog with some newer and better quality photos of them. I don’t want them to be merely background decorations. To those who have been reading here for some time now, I am grateful. Thank you for your eyes, a tiny spot in your day that could be spent doing other things (especially when it comes to this sort of navel gazing post). And thank you for all the likes and the comments. I look forward to embarking on a period of my life now where I can once again be a little more involved in this WordPress world and the writers and readers here that bring me joy. Thank you! My Barbaric Yawp: why I need more poetry in my life. Congrats! Your posts are always something to look forward to. Thank you, Charles! I truly appreciate that. Congrats! I too probably spend too much time looking at stats, but as you say they can be fascinating and puzzling. Some of my most popular–at least according to the search engines–are the series of true life ghost stories I posted last October. People love their ghosts, as well as love. Another super popular search result has been my post on George Saunder’s fabulous graduation speech–it’s popular all year long–go figure. I like your new header (I liked the old one too). Many congratulations, David. Your face lift looks good! You are inspiring me! K.
Yay! Couldn’t ask for a better compliment. Thank you. …hits! That truly is an accomplishment, and a testament to the longevity and excellence of your blog. And I really like the new header–very appealing! I’m excited to hear your new work schedule will allow for even more creative time. Congratulations, and I’m looking forward to everything that comes next for you! Thank you, Jennifer. Your high regard means a great deal to me. I admire you and your work so much. And yup, this is the first time in a decade I think that I have not been full-time in a restaurant, whilst trying to do all the rest I have wanted to do. It’s been a long time coming, and it’s a tremendous relief. Cheers to you and what you are doing. You are an inspiration. You have an inspiring blog, David! Congratulations!